We have already done Ionic Firebase login with Facebook in the previous example. In this example, we learn how to use the Gmail native plugin to authenticate with Ionic through Firebase. For most of the authentication in Ionic through a 3rd party is setting up the configuration and actually writing code in less and easier. In Firebase console and to enable Gmail authentication for our app. To enable Gmail authentication we need to go to Firebase Console and locate the app you’re using. Inside the app’s dashboard, you’re going to go into Authentication > Sign-In Method > Gmail and click the Enable toggle to enable. Configure for the Android platform: – In this example, we first create Google credential for Android in our Ionic apps. We have to set separately configuration for ionic Google credential for IOS. For the project name, Google developer is going to ask you to create a new app or to select one from the drop-down menu, you can select the Firebase app you have already created. Android package name type com.edupala.starter2googleLogin from ionic config.xml. By default package name is io.ionic.starter.It is good practice to change default package name. On clicking on CONTINUE ON will take us to the new window, To enable Gmail Singin in our project, we need to generate an Android Sign in Certificate SHA-1. Google provides two SHA-1 certificates you’ll need, one for production and one for development. For this example, we are generating SHA-1 certificate for Android development. We need to run a command on terminal. Where most of the case ~/.android/debug.keystore is on Windows you will find in C:\Users\Username> .android is hidden file and copy the SHA-1 certificate and the past in our Google developer and then click on Enable Google Sign-In, and that’s it, you can click on generate config files, but we’re not going to need them. We had finished Google authentication for Android, now we start configuration for ISO click here. In Google developer is going to ask you to create a new app or to select one from the drop-down menu, you can select the Firebase app you have already created. file and copy the package id of the app. We have already done for Android past the widget ID in iSO bundle and click on CONTINUE TO. , which is a config file for iOS.
. Open this file, copy and past the reversed client ID. We have completed the external configuration, now time to write code for our Google Authentication for Ionic Apps through Firebase. We will add a provider for the authentication code. We have to specify the webClientId in the Credentials section in the Google Developer console. 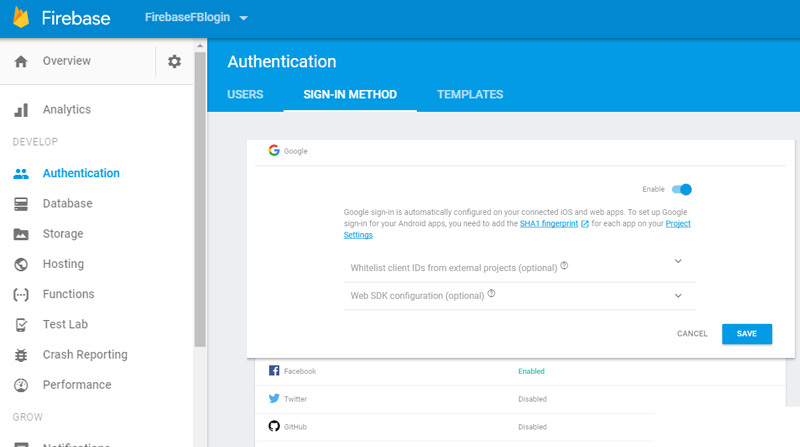 We can get web Client ID from Firebase dashboard -> Authentication -> Inside the Google sign as shown below. In auth provider class we have added code to login with Google Plus and log out functionality. Modify src/pages/home/home.ts, we need to import AuthProvider for Google login/logout . Modify the src/pages/home/home.html, here we are adding two buttons to trigger the login and logout process and displaying user profile information from Google Plus. At last, we have to register the provider for Google Plus Cordova plugin and we also have to add reference of AuthProvider in app.module.ts file.